Tai Poole is trying to find answers to life's biggest questions. What happens after we die? What is love? How can we fix climate change? He may not solve them all, but give him a break ... he's only 11 years old. Tai is coming back for season 2...and he needs your help! Tai is coming back for a second season this September. Do you have a question you'd like Tai to answer? Send them our way! Plus, Tai Asks Why has been nominated for a Webby Award! But to win, we need your vote! 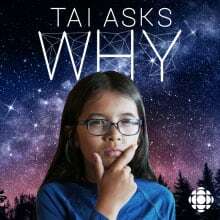 Head to cbc.ca/taiaskswhy to learn how to vote or to ask Tai a question. Download Tai is coming back for season 2...and he needs your help! Tai is freaking out about climate change. He's worried we're doomed. Tides are rising, species are dying from all of the heat. He's finding it hard to have hope...until he meets a man from NASA. Download How will we fix climate change? Before he fully spoke English, Tai's first language was math. He loves numbers! Now he's talking to mathematicians about the ultimate coolness of two very special numbers: zero and infinity. Download Which is cooler, zero or infinity? After thinking through a recent terrifying nightmare, Tai starts to question the importance of dreams. Why can't our minds just do nothing when we sleep? Download Why do we dream? The death of his grandfather has Tai thinking about the afterlife. The idea that our bodies and consciousness become nothing is really weird and confusing. So Tai turns to different religions for answers. Download What happens after you die? We've all heard the saying trust your gut, but is that scientifically accurate? Tai grapples with what that really means. If our guts are making decisions does that mean there's a brain in our gut? Download Should we trust our gut? Love is weird. How can this thing take over your body and bend it to its will? Tai looks to science, philosophy and his mom for answers. Meet Tai Poole - a little guy with big questions. Join him as he heads from universities to playgrounds seeking answers. He may not solve all the mysteries of life, but give him a break ... he's only 11 years old. Coming October 24.